Kotlety were a favorite comfort food of mine growing up. My Mom made the best kotlety; full of flavor and made with love. It’s funny how a simple food like this triggers vivid memories. Once in a while my Mom’s Kotleti came out slightly “over-browned” or as my Dad called them,”burnt”, but I still enjoyed them thoroughly, so did my Dad even though he grumbled a bit at the burnt pieces he’d scrape off. They were such the comfort food for me that I even remember them making a bad day seem better. The very first time I tried cooking them myself as a teenager, I remember burning my forearm with a big splash of hot oil after rushing and dropping a kotleta (singular form of kotlety) into a hot pan. Ouch! That was also one of my first experiences cooking for my parents. I’ve cooked a lot more kotlety since then with no major issues; only delicious outcomes and very satisfied tasters. If you ever eat a burger with a Russian who might have not eaten a western burger before (yes, I know these days it’s unlikely to see such a site), you might find them taking off the bun and eating all the toppings separately, using a fork to eat the burger. That is at least what I remember seeing at times in my travels and encounters with Russians growing up. Times have changed over the years of course as western culture has infiltrated most Eastern European countries. You will see people eating Kotlety with ketchup as a topping, sauteed mushrooms and onions or maybe even a creamy white mushroom sauce (my Dad’s and now my husband’s favorite way to eat them, recipe in future post). 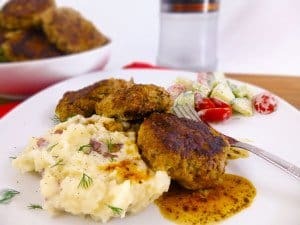 They are also sometimes considered more like large meatballs and served with mashed potatoes or over rice with a vegetable or side salad. Kotlety can be made with ground beef, pork, chicken or even turkey. My personal preference is a beef and pork combination. I will say that chicken Kotlety are very popular in Russia though, they’re just not my personal preference. My family and I love this combination the best. My kids compliment me through the entire meal when I make these, and I just eat it up; thrilled that they love a comfort food I grew up loving. Making kotlety with a panini press is far from traditional, but so wonderfully convenient and efficient if you don’t have a huge even cooking skillet you can cover. They cook in just 4-5 minutes flat, depending on your panini press. Ours will cook to temp (minimum 165 degrees) in 4 minutes, but for a nicer brown I’ll cook them for 5 minutes. I like our particular panini press for these because it has height adjustments and I can simply make my patty as a ball and then set it to the level above “toast” and set down the press. It leaves an opening on the panini press and the kotlety is squished just to the right height still cooking both sides simultaneously. This panini press also is great because it leaves grill marks on one side only so you can choose whether to serve with grill marks or not and it cooks more evenly than deep grooved panini presses (this press also has a perfect pre-set temperature). 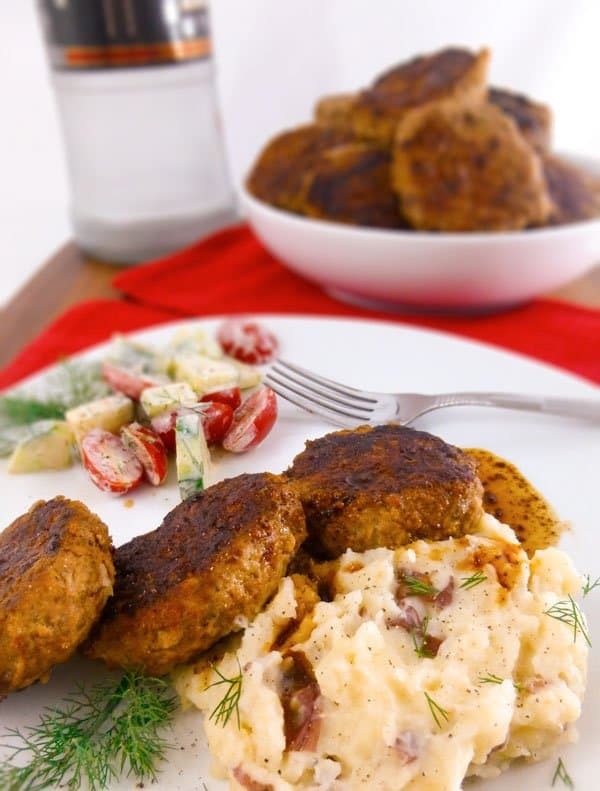 Whip up a batch of these savory Kotlety and let me know what you think. Hopefully you enjoy them as much as my family does! 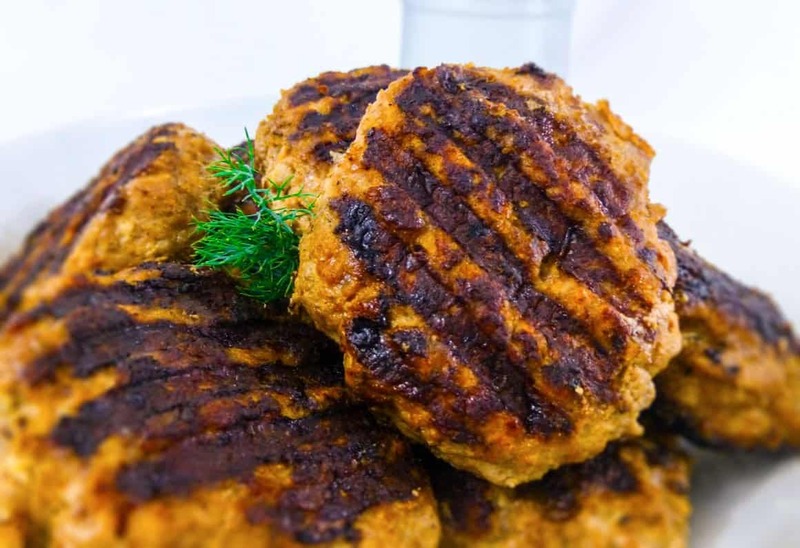 These are some seriously savory meat patties that are like bun-less burgers or large meatballs. This recipe makes 16 Kotlety so feel free to double if you need them for a larger crowd. They will freeze well also for a future meal. Add beef and pork to a large mixing bowl. Place bread in small bowl and pour milk or water on top and let bread soak for 2-3 minutes. After time is up, mash up bread and milk with fingers until it's all wet and crumbled. Add crumbled bread and remaining ingredients through eggs to the bowl with meat. Preheat skillet to Medium and once warm add enough olive oil just to coat bottom. (If using panini press preheat it now) I do like to use a cast iron skillet sometimes to make these as well, but you need to watch the heat on the cast iron more closely to not burn the kotlety. Mix meat mixture well (fingers work best) to combine all spices. Flip patty and cook about 4 more minutes and browned. Check internal temperature of fattest patty with a meat thermometer (165 deg. minimum) You can keep cooked Kotlety in a 170 degree oven while cooking the rest. They cook thoroughly with a nice even brown in 4-5 minutes, no flipping of course. Best served with mashed potatoes, roasted potatoes or rice and a vegetable or side salad. Good ketchup or a homemade mushroom sauce is great with these also. I sent you an email back, Alyssa. Thanks for asking. These look great. I think I will try making them soon. Thanks. Hope you all are doing well.